Today, on the lunch break time Nina, my classmates and I went to the Food Coop. 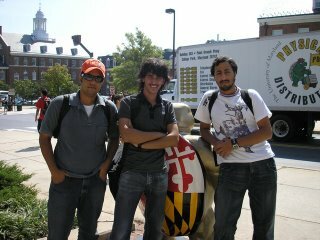 when we got to the Stamp Union; Nina took a picture of Amer, Saoud, me with a turtle sculpture while the other classmates were walking. Then all of us took a picture at the main entrance of the Stamp Union. Next, we go downstairs to the Food Coop and we saw the food. They have mostly vegetarian food. We also took a picture there. Then most of us went to another restaurant; I went to Subway. Because we aren’t vegetarians just Nina is. I like to go to Subway as well. We have stores in Japan, but I like the stores in the US better because they have various kinds of sandwich! You don't have to be a vegetarian to eat vegetables! Do you have to eat meat every day, twice a day? Actually, I am not a very strict vegetarian. I eat dairy products (like cheese and yogurt, and of course ice cream), eggs, and (occasionally) fish. But I never eat meat or poultry. Do you like "food coop"? I think that you are a person who with warm-heartedness. You always give me a favor when I inneed. Thank you so much!! Thank you for writing in my blog. I like subway but I ate it twice in my country because I always eat from my house made but when l came to USA I am almost eating from Subway. Thank you for writing in my blog. I am eating meat everyday. I like vegetable but not too much.